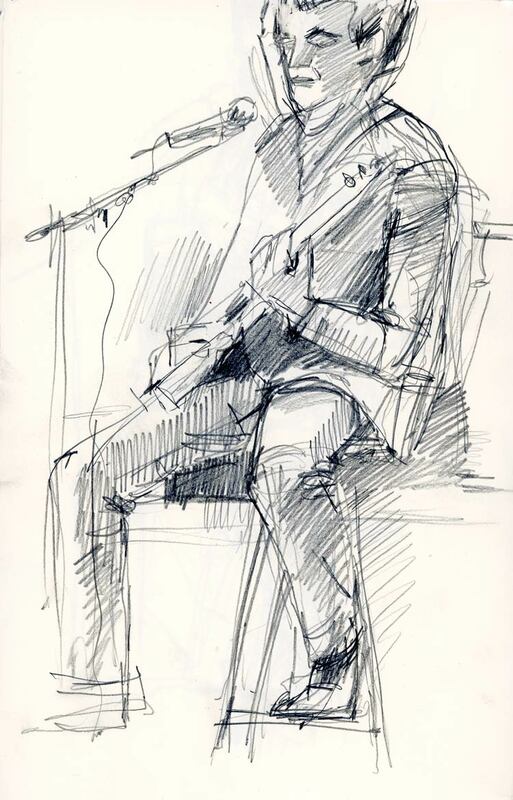 I have taken my sketchbook to concerts in the past, but usually I find somewhere to sit and I manage to find a bit of light to draw by, so last night was bit of a challenge. I drew R&B singer James Hunter (the opening act) in the dark, while standing, with just a little bit of light on my sheet from one of the wall sconces. The main event was Sharon Jones and the Dap Kings but by that time she arrived we were shoulder to shoulder on the floor area near the stage. And besides that, Sharon Jones is a fire-ball of energy so I gave up and just enjoyed the show. Hi 5 Saw their performances in Victoria on April 4th. Wow! They were amazing. Have all their music. (James & Sharons) The audience was dancing nonstop. Thanks for the drawing. Sharon moves too fast and energetically to catch in a drawing. Very uplifting. Warmest regards Dean Mollon (Going to vancouver workshop and seeing Dwight Yoakum on last day evening) Honky Tonk foot stomping! Hi Dean! Yes, we have all their music too. The new James Hunter CD is great. Do you have that? I was kind of surprised to see him alone on stage because last time he was here he was with his band, but he was still great. As for Sharon Jones, she is a force of nature. We had tickets for her show last year which got cancelled when she had cancer so we were thrilled that she came back this year. She had half the audience on stage dancing with her, which must have been the same in Victoria. At one point a fight broke out in the audience and instead of getting security to take away the offenders, she brought them up to the front and hugged them. See you in Vancouver! Very Nice. I love also all your pointing. Shari, Moleskine sells a small led light for reading a book at night. I find that it attaches quite nicely to a sketchbook and provides enough light to help when drawing in dark locations. You might like to check it out. Once again, you have a lovely website and I enjoy both your comments and images.